If you hear the name Donald Trump, you will probably think of politics or business. In this blog post, I do not want to talk about Mr. Trump's political positions. Instead, I want to share some tips that you can use for your presentations, especially for sales presentations. Trump, as a master saleman, always knows what his message is. In politics, he uses techniques he has learned from sales. He knows exactly what idea he wants his listeners to take away after his speech is over. You can "borrow" some of the tricks that he uses, to pep up your presentations and make them clearer and more convincing. Sound good? Please read on to find out how. If you listen to a speech by Donald Trump, you know exactly what his message is. He repeats the main idea, always coming back to it. The most important idea is stated in a very simple form, usually just three or four words. Here's a technique you can try when preparing for a presentation, to make sure your main idea is clear in your thoughts. Imagine that you are in an elevator in the building where you work (or where you would like to work). The doors open and the head of the company or the head of your department gets in. You have 60 seconds to present your favorite idea. You might never again have 60 seconds alone with this person! What do you say to "sell" your concept? Make sure that you have your elevator speech in mind before you give a presentation. What's the most important idea you want to present? 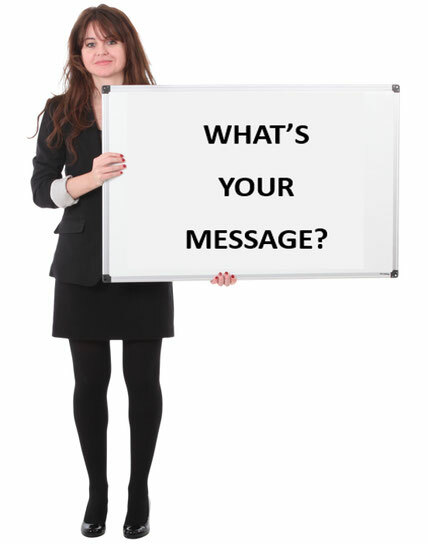 Can you deliver your message in 60 seconds? Set a timer and check yourself. Ask a friend to listen and give you feedback. Practice makes perfect! Check your slides and notes for your presentation to be sure that your main point shows up clearly and often. Keep coming back to it. Make it your goal to have every listener know what your main idea is. If you, like many people, tend to get nervous before an important presentation, being clear about your main idea will help you. How does this work? If you've practiced your elevator speech, you know which idea you always want to return to. Then, if you lose your focus for a moment during your presentation, thinking back to your main idea will help you get back on track. One U.S. newspaper, the Boston Globe, analyzed the language that candidates for President were using in their speeches. (To read the article, click here.) Guess what? Donald Trump used English that was about at the right level for a fourth-grade schoolchild! Keep your grammar simple and use short sentences whenever you can. This way you can concentrate on how you are presenting the material. Don't worry about using complicated words and sentences. If you focus on your body language, your tone of voice, and your timing, you can use your energy to connect with your audience. To find out more about Donald Trump repeats his key words to deliver his message, take a look at this YouTube video.